Here is one of the very first videos I ever made. The first half of the video explains why I started drinking kombucha and how much it helped my family and me. The second half shows the process of how to actually make kombucha. I hope you enjoy the video and you will learn not only how to make kombucha, but why you should. It’s still my favorite beverage and I’ve been making and drinking it for 18 years. Come into my home and learn to make kombucha. Enjoy! 54 Responses to "Video – How to Make Kombucha"
Love the video! I have my scoby and starter culture. Ready for this adventure! What is “second fermenting” and why would you do it? How do you make different flavors of kombucha? My bucha smells the whole house up like vinegar. What can I do? You’re letting it ferment to long. Does it taste vinegary? Try fermenting it for less time it shouldn’t get that strong vinegar smell. I made kombucha 25 years ago or more in a bowl. Recently obtained a scoby from a friend. It sunk when I started the process but a new one formed in 4 days or so – it sunk too. Then a 3rd – it has sunk too. Now there are 3 (the top 2 thin, the bottom one nearly 1/2″ thick) and another one forming on top. I’m maybe 2 weeks into the brewing. What am I doing wrong? Are you moving the jar at all? This can cause it to sink which it okay but I wonder if its getting bumped around? I used to make kombacha, and am going to start again. I travel a lot, and would like to keep drinking it when I’m away. I do see kombacha sold in some drink isles at grocery stores. Are there any makes that are more “accurate” than others? I do this all the time while traveling and Gt’s synergy is the kombucha I most recommend. I started my first batch of kombucha on May 4th. Now, two weeks later, it has a very thin scoby on top. It tastes sweet, so I assume it is not fully fermented. Also, I don’t have a heat source like the brew belt, although the house is warm, around 78-80. Do you think it is progressing normally? It seems a little slow but thats ok, let it ferment until its tart but not vinegary. I’ve been making kombucha for a year now and would like to take a break from making it for a month or so. How should I go about this? Do I need to keep a Scoby or kombucha from my last batch to start again later on? Yes keep a scoby in a couple cups of kombucha tea in a jar with a lid on the counter and it should be fine. I’ve been brewing my own kombucha for over a year now with the same scoby…but in between batches I store it (it’s massive) in a glass container with kombucha, with the rubber lid on, in the FRIDGE. Before I brew another batch I always let it sit on the counter overnight to come to room temperature, then brew another batch. I’ve NEVER had a problem with this method and my scoby seems to thrive! Is this OK? Hi Donna. Is there any alcohol content in the finished Kombucha? What I do know that kombucha has as much alcohol as orange juice and then it turns to vinegar which is not. If you second ferment it it can have more but very limited and quickly reduces as it ferments or is stored in your fridge. I only have wide mouth jars to store the kombucha beverage in-no narrow mouths (too expensive at this moment). Will that be be sufficient and also will an airlock work well with it? Can you use kombucha to ferment your vegetables (like whey)? Do these two or (one) help develop vitamin K2? Again, a supplemental question about when and the value of using airlocks. Thank-you! You can use wide mouth jars but they leak out a lot of the carbonation. I don’t use and airlock with kombucha as it needs the oxygen to ferment correctly. Kombucha doesn’t work as well to ferment vegetables and they get really mushy in about a week and you also diminish some of the other stronger good bacteria in cultured veggies. All cultured foods help in the building K2 in the gut. Can you use an airlock for the second fermentation for either kombucha and kefir? Also, some herbs and spices are anti-microbial (such as cloves, oregano). Do these affect the good bacteria that is being cultured? Do these different cultures, when one is consuming all of them , do they conflict within your system and cancel out each other. Or so all of these sources of probiotic work together? What are the sources/sites of the best research you’ve found for kombucha. Books, websites, etc. Thank you. This is my favorite. http://www.kombucha-research.com/ But you will have to buy the book. 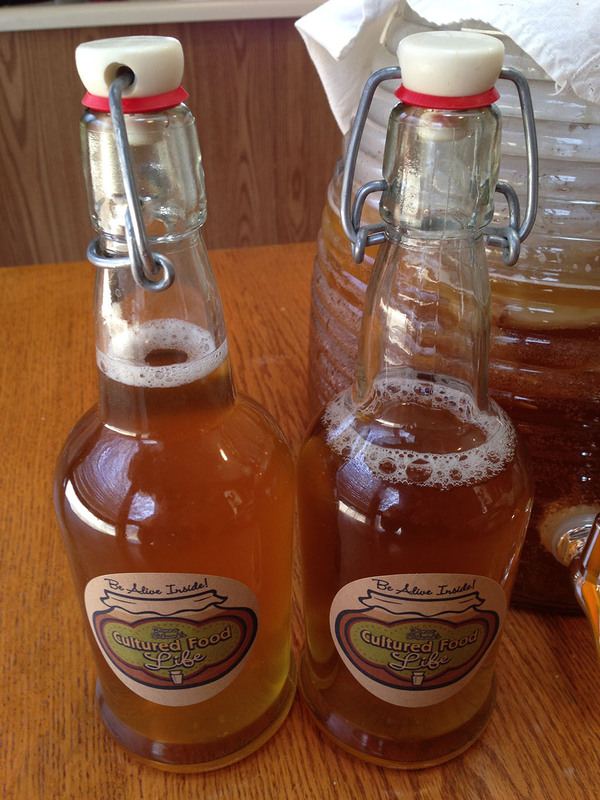 Which do you prefer, water kefir or kombucha? I haven’t tasted water kefir, but Ive been making kombucha for a few months now. And qhi ch one has more beneficial probiotic in them? hi. I didn’t receive an email with the confirmation link for the free e-book. is it like alcoholic like bear or wine? Do I need to strain my kombucha? I have brown stringy things floating in the liquid that look scary!! You can strain it and yes they look scary but they’re a good thing! Your video was so informative and helpful. It makes me want to make it every chance I get. I made one batch from someone else information. It turned out OK but not great. You have given me courage to try again!!!! Hi Donna, love this video and would love to try making some, I regularly make many fermented foods but have yet to try kombucha and kefir because I would have to purchase the cultures and can barely afford food, grow a lot of my own. I was wondering where would be the best place to look locally to maybe find someone who would be willing to share, trade or barter? Is there a group I might search for in particular? I am in Lehigh Acres Florida if that makes any difference. I’d appreciate your thoughts since I don’t know where to look. Thank you! Keep up the great work hon, you are doing a great job spreading the good word! Here are some places you can look for a starter or maybe a local health food store would know too. Hi Charzie, I live in Ocala. I have been making milk kefir for a few weeks, and my grains are growing pretty fast. I have given some away and fed some to my dog. (He loves them!) I’d be happy to share some grains with you. I also have started my first batch of kombucha, but don’t have any culture to share yet. Maybe in the future. Contact me if you are interested. Can I use a brew belt on a glass gallon jar? Great video! I am new to this, so wondering if I can use any tea or does it need to be the only the ones that you mention? Thank you! Don’t use herbal teas or ones with oils like Bergamont but other than that most tea will do fine. Donna — I have had a grape Kombucha with chia seeds, and love it. Would the flavoring come from making the Kombucha with a flavored tea? At what point would one add the chia seeds? Thank you! A friend shared a scoby with me that she put in a zip lock bag, how long do they last like that? doesn’t the scoby absorb the plastic? I was concerned about that. And also just in general, how long a scoby that is not being used to make the kombucha lasts, or maybe it just keeps on living as long as you don’t get it too hot??? A scoby must be stored in the tea and would last a month this way. I’m relatively new to the Culture of Cultured foods…lol! I’ve been reading and subscribed to your blog not quite a year. I began following along after a blogging friend sent me a link of yours… right after I was given a T2 Diabetes diagnosis. Right away– I began reading up on Kombucha. I find the best information from the web…here on your site! I found a local dairy farmer and Mennonite family that willingly GAVE me my first SCOBY! I still have it… and it still works for me. I don’t know that you’ve ever mentioned how long they keep. I did not make Kombucha in the winter months, my home stays a bit on the chilly side. Today’s video was the first time I’d heard of a BREW BELT or heating belt. This is going on my wish list! I missed the Kombucha through the winter. I recently read of an actor Andrew Keegan– arrested for selling Kombucha and that Kombucha is regulated by the ATF? Have you addressed this on your site? It was news for me this weekend. After doing a bit of research– I found that brewing with a cloth cover, like you show here in the video (and how I brew my Kombucha) limits the amount of alcohol. Oh… and I recently began following along on Instagram! I have more to say on the subject of Cultured foods; Kefir (my newest endeavor) and L.F. veggies (which I am coming to love!) – and how it has impacted my life, since the T2 Diabetes…but I’ll share those another time. Thank you for always sharing your knowledge with me! What I do know that kombucha has as much alcohol as orange juice and then it turns to vinegar which is not alcoholic. If you second ferment it, it can have more but very limited and quickly reduces as it ferments or is stored in your fridge. I didn’t think it had anything to worry about– but I’m question why it would be regulated. I’m learning so much here. And… thank you for commenting today and setting me and my followers, on Instagram, straight on the Kefir question. Can I use herbal teas to make this? Do you have a non-caffeinated starter that you sell? It’s actually against my religion to drink regular tea, but the herbal type is fine. I’d really like to make kombucha. You can’t not use herbal teas as they have properties that can kill the culture. You can also use roobuis tea which does not have caffeine or decaffeinated teas will work too. I use roobuis tea to make mine for the same reason & I love it! I use about 8-10 tsp. of loose organic roobuis tea I purchased on Amazon. My scoby doesn’t fill the top. If it does, how can you taste the kombucha to see if it’s ready withoubdisturbing that seal? You will disturb it but that’s ok it will just grow another one on top. I use a pot with a plastic spigot so it doesn’t disturb the scoby. Is there any way of making Kombucha for people who cannot have sugar…? Most of the sugar is eaten buy the culture so there is very little left.